Produce a quick, easy, and self-sustained camp fire with these Norwegian Candles (Viking Logs). One log will burn up to 2 hours, and provide light and warmth. ideal for Forest Schools, Adventure Groups etc. 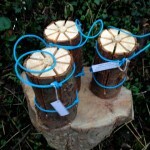 The Norwegian logs shown are made by Green Scythe Ltd and can be delivered to site ready for your Forest School classes.